October may be National Pet Wellness Month, but when you use products like Clean + Green Carpet & Upholstery pet odor and stain remover you can make every month pet wellness month! Coming from someone with asthma, this is high praise. Clean + Green is made by SeaYu and does not contain heavy scent or dangerous VOCs (volatile organic compounds). There is no need to worry about overpowering your pet’s sense of smell, or more importantly, having pets and people inhale unhealthy chemicals. Clean + Green products are made to specifically target stains and odors and how they interact with different surfaces. The enzymatic action encapsulates odors and, no kidding, the smell of an accident or sour stomach disappears! Stains don’t need rubbing or scrubbing. Just clean up what’s on the surface, spray on Clean + Green, let it sit and vacuum. That’s it! You’ll notice the difference as soon as you spray. The entire product line is packaged in 100% biodegradable and recyclable materials, and the manufacturer’s claim they are all non-carcinogenic and non-toxic. I appreciate that SeaYu is working to clean up our environment as well as our pet’s messes! Clean + Green – What’s In It? If you hate reading a long list of ingredients that not even your memories of high school chemistry can decipher, Clean + Green is just the cleaning agent for you. Everything on the ingredients list is English: cane sugar, mixed botanicals, hydrated cellulose, purified water, and nitrogen propellant. Now you can smile! Even if you get it in your eyes, rinse with water. I want products I can count on to work, products that don’t choke me with fumes, and products to clean up after my dog that won’t harm my dog. Clean + Green Carpet and Upholstery Pet Odor & Stain Remover for Dogs and Cats penetrates deep down into the carpet reaching the source of those nasty odors and stains from urine, hairballs, vomit and other pet accidents; 16 oz. Once Clean + Green comes in contact with the problem source, it surrounds and eliminates the odor and stain-on contact. To get rid of old odors; it may just take several applications. As long as stain has not yet been “set” into the carpet or fabric dyes. Quick and Easy: Works on contact . Just spray-no need to soak, scrub or rinse. Exclusive patented encapsulation technology and advanced eliminator formula. Clean + Green Carpet and Upholstery Pet Odor & Stain Remover for Dogs penetrates deep down into the carpet reaching the source of those nasty odors and stains from urine, hairballs, vomit and other pet accidents; 16 oz. To get rid of old odors; it may just take several applications. 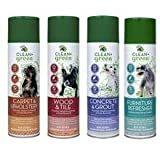 Find more Clean Green Carpet and Upholstery Pet Odor and Stain Remover for Dogs products on Amazon!